Starting life as a Kickstarter project, the Timeshare Alarm Clock intends to be a time changer (pardon the pun) when it comes to alarm clocks that are used by consumers as well as in the hospitality industry. Duaxi founder and inventor Scott Buss figured out the everyday consumer needs to own an alarm clock that is not only visible from all areas of one’s sleeping place, be it in a bedroom, a dormitory or a hotel room. 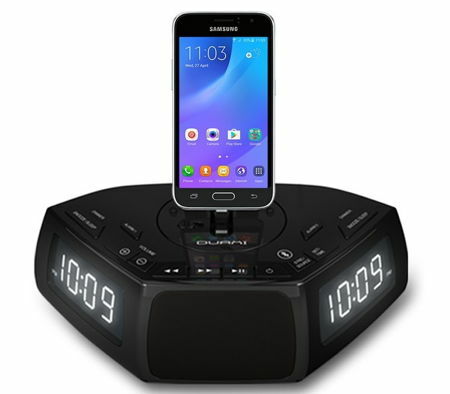 Hence, the dual display integrated into this Bluetooth capable alarm clock. There is also a patent pending swiveling dock that will support Lightning (iPhone) and USB-C (Android) connectors, where the dock pivots to enable users to view the smartphone’s screen from multiple angles. Accompanying all of those visual cues would be a high-quality speaker that is perfect for listening to music as well as making calls from your smartphone. Since it is able to face virtually any direction (on a horizontal plane), you will also be able to comfortably perform a video chat from your nice, warm bed without having to get out of it. The days of limited viewing areas and the inconveniences of traditional, single-display alarm clocks are over with the Timeshare Alarm Clock.